In addition to the Helix and Intel-powered Yoga 11S, Lenovo will also be shipping two more notebooks this coming April for business users as part of the Edge E Series. Called the ThinkPad Edge E431 and Edge E531, the notebooks will sport 14.0-inch and 15.6-inch antiglare displays with HD and Full HD options, respectively. The starting price of $500 should attract most users on a budget and will be hitting the U.S. market first. According to Lenovo, the touchscreen variants of the E431 and E531 will launch a month later on May starting for $550. As for the OS, The E431 and E531 will run Windows 8 or Windows 8 Pro. Processor options range up to a Core i7 with Intel HD 3000 or HD 4000 graphics. Dedicated GPUs are still out of reach, but at least the RAM and HDD can be upgraded up to 16 GB and 1 TB, respectively. For the chassis, Lenovo estimates a height of about 26 mm and a weight of 2.13 kg and 2.44 kg for the E431 and E531, respectively. 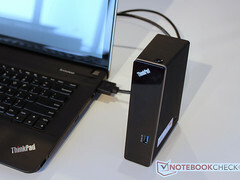 Physical connectivity includes Gigabit LAN, Bluetooth, 720p webcam, VGA, HDMI, 2x USB 3.0, 1x USB 2.0 Always-On, 4-in-1 card reader, and a combo 3.5 mm audio jack. Most notably, the new notebooks will include a proprietary OneLink connector for docking stations. The most interesting change lies in the plastic clickpad which, although familiar, now integrates the TrackPoint and is able to register 5 different clicks depending on the location of the surface. The clickpad is similar to the one on the recently revealed Helix and we expect it to be integrated on future ThinkPad models. The docking station connects via OneLink without any additional power sources. Through the single OneLink cable, the unit provides 2x USB 2.0, 1x USB 3.0, VGA, HDMI, an Ethernet port and a 3.5 mm audio jack. Lenovo intends to launch the new Edge notebooks in red, black, and silver color choices.